By the time I reach the second night of my trip, my knife is humming in my bag, and I know I’m close to my wolf. I’m going to find her tonight, and then I’ll find out if I’m really programmed for the task of killing and skinning a living creature. We slip in through the back, and I lead the way into the living room. I’m about to explain my first trip through the house when a flicking switch makes me jump. Alice Culpepper believes Fate is smiling on her when she is tricked into a reunion with the bullies who have made her life hell for years. But she is punished for taking revenge on them, and her violent outburst reignites the local weredogs’ distrust of her. Her life is further complicated when Miriam Frost calls to warn Alice that she is being hunted by another wolf, Teresa Martinez. Then Alice stumbles upon a house haunted by a lycanthrope who may have been murdered by the weredogs, threatening to destroy their shaky alliance. As if this wasn’t enough trouble, Alice is called to her wolf and must deal with a unique set of problems none of the other lycanthropes has dealt with before. Though she must keep her parents in the dark about her supernatural sleuthing, Alice isn’t dealing with these dilemmas alone. She’s got help from FBI agents Lilith and Bat Vayne, her packmates Pi and Josie, Sophia the witch, and her teammate Jesse Espinoza. She’ll need all the help she can get, because war is coming to Dallas, Pennsylvania, and no one will be safe in the coming battles. 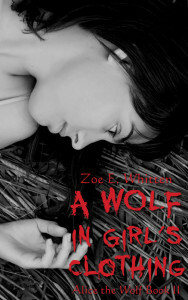 You can find A Wolf in Girl’s Clothing on Amazon, Kobo, and my blog bookstore for $4.99, and it should soon be available on Barnes and Noble’s Nook Books store. You can check out a free preview on your Kindle, and over the next week I’ll be posting a few short excerpts from later chapters. I should apologize for taking so long to get this book out, but it’s been a rough year thus far, and I had trouble finding time to get into revisions and then edits. Hopefully it won’t take nearly as long to release book three, In the Mouth of the Wolf. I hope you enjoy Alice’s story, and as always, thanks for checking out my stuff.